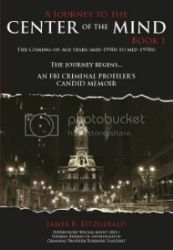 Purchase a signed copy of Jim “Fitz” Fitzgerald’s A Journey to the Center of the Mind, Book III – The (First Ten) FBI Years. A Journey to the Center of the Mind, Book III – The (First Ten) FBI Years. Upon graduating from the FBI Academy, newly minted Special Agent James “Fitz” Fitzgerald heads to his first office – New York City. Once there, Fitz is immediately assigned to the highly- respected Bank Robbery Squad. The investigations begin. Before long, he’s involved in the arrest of serial killers, murderers, robbers, kidnappers, extortionists, and pedophiles (including a fellow FBI agent), all on his way to a promotion to Quantico to the Profiling Unit. Fitz’s first assignment as a profiler is to the Unabom Task Force in San Francisco. Once there, he helps finally solve the 17-year long investigation…with language, of all things.